The winter doldrums are upon us. I miss the farmers markets and warm sunny afternoons. However, it is going to be a long road until spring. So I need to find some sunshine anyway I can. That is exactly what this dish is. During the winter months citrus fruits are a lifesaver. They add a pop of color and a refreshing burst of flavor where needed. This farro salad is great as a side or make it into a main by throwing some grilled shrimp on top. It also is a great next day lunch! 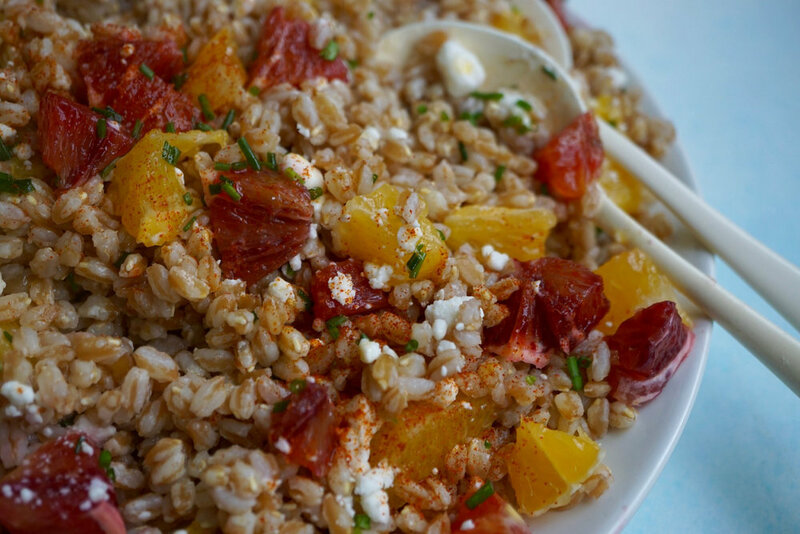 Cook farro according to package directions, drain and set aside in a large bowl. In a small bowl whisk together the ingredients for the viniagrette. Add the oranges to the farro and gently mix through. Then pour over the viniagrette and goat cheese toss gently and let rest for 15 minutes or so. Then serve.